Last month Google again topped our charts with the news that they are facing more scrutiny with their acquisition proposal of ad firm DoubleClick. August was a busy month with the major engines all making news at SES San Jose. With that here is a look at the top seven search happenings for the month of August 2007. #7. YouTubers Threaten to Revolt - YouTubers threaten to revolt over new ad placements. #5. Microsoft Completes Buyout of aQuantive - Microsoft (MSFT) announced that they have completed their acquisition of the digital marketing / ad firm that they had been pursuing for a number of weeks. Microsoft closed out a $6 billion buyout of aQuantive (AQNT). #4. Yahoo Tops Google in Satisfaction Survey - According to a University of Michigan customer satisfaction survey, Yahoo has a 79% consumer satisfaction rate over Google's 78% consumer satisfaction. #3. Enquiro Research Releases Whitepaper on Personalized Search - Enquiro research has released their latest whitepaper on search. This time they tackle personalization of search with a look at the search engine results page in 2010. #2. Yahoo Update Local Search Offering - Yahoo! made some big news with the announcement of that they have updated their local search service offering. Judging by the buzz around local search at SES San Jose this is a step in the right direction for the number two engine in the search space. #1. SES San Jose 2007 - Search Engine Strategies 2007 San Jose featured the best of the industry discussing the latest tactics and strategies for succeeding in search. 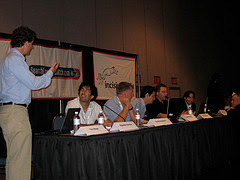 Search Engine Rountable has the most extensive coverage of the sessions.